A systematic, step-by-step description of how this Yahoo! Store (www.ytimes.info) was first built. Everything in this site was built using RTML! Learn how it's done from a recognized Yahoo! Store / Merchant Solutions expert, Istvan Siposs. In order to understand and appreciate what's contained within this book, you should have a good working knowledge of the Yahoo! Merchant Solutions Store Editor. You should know how to build a "plain vanilla" store, and you should also be familiar with how to work the store in the Advanced Interface. It is also highly recommended that you know something about RTML and HTML. This book should not be your first introduction to RTML! If you need an RTML foundation, we recommend you start with a copy of RTML for Yahoo! Store at www.monitus.com, or RTML 101: The Unofficial Guide to Yahoo! Store Templates in this store. This eBook will not discuss the Advanced Interface or the elements of RTML. WE ENCOURAGE YOU to look at the table of contents and the introductory chapter (both included here) to help you judge whether this e-book is for you. This is not an introduction to RTML or Yahoo! Store templates. If you are interested in learning about RTML, we recommend you purchase RTML for Yahoo! Store from www.monitus.com, or RTML 101: The Unofficial Guide to Yahoo! Store Templates in this store. Available in electronic (Adobe PDF) format only (1.2 megabytes). Please note: because this is an electronic publication, like most organizations selling eBooks, including Amazon.com and Yahoo! Shopping, we cannot offer a refund on this product. Therefore, before purchasing this eBook we highly recommend you read the table of contents and the introductory chapter. Every web site is (or should be) a work in progress. You can never say that, "here, this is my web site or online store, it is done." As time goes by, new information is added, old information is removed, or you may find out that certain things can be done differently, or perhaps you change the appearance of some buttons, banners, images. Our store is no different. You may find that when you read this book and compare the screen shots to the pages of www.ytimes.info, they won't match. We do upgrade our store from time to time and for obvious reasons we cannot keep updating this book each time we make a change in the store. 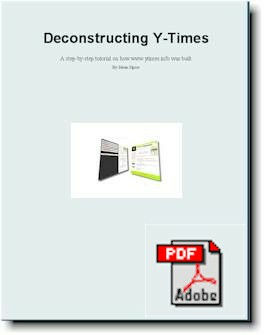 This book, therefore, describes how our store, www.ytimes.info, was first built using completely custom-written templates in RTML. The purpose of this book is to show you in general how you can use RTML to build your own store. WARNING! This eBook is not intended for beginners. If you have never used the advanced interface or the RTML editor before, please read RTML 101 or RTML for Yahoo Store first.